I’m completely delighted to announce that my so-fun-to-write little billionaire shapeshifter novella RAVEN HEART launches into the big brave world today! 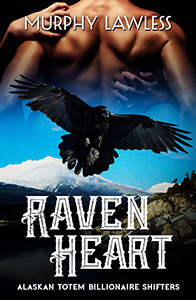 RAVEN HEART on Barnes & Noble (Nook)! A curvy woman determined to protect her town, a raven shifter protector with secrets to keep, and a beast out for his own profit add up to an action-packed romance! …until gorgeous, sensual Richard Yale arrives on the scene. He’s like no man Elena has ever met–and not just because he’s richer than Midas. Richard’s life as a shapeshifter and a protector of the Tlingit people must remain a secret–until the price of keeping secrets could be the life of the woman he falls in love with at first sight. Murphy Lawless has a Facebook page, a Twitter account (which will be more useful when I find a client that lets me manage more than one freaking Twitter account at once), and will soon have a website as soon as I get hosting for it. Oh, and a mailing list! I hope you enjoy reading RAVEN HEART as much as I enjoyed writing it! Congrats! I use Tweetdeck to manage Twitter for me and for a 'nym. I can configure it to make me confirm I'm using the proper account, because I want to make sure Mindy Klasky folks don't get a, um, surprise from the other account. I need to examine Tweetdeck, yeah. Thank you!